Type Locality RÃ­o Acaray, above the lake behind the dam, 25Â°23'S, 54Â°42'W, Alto ParanÃ¡, Paraguay. 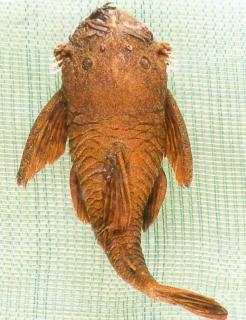 Etymology The name Ancistrus is derived from the Greek word agkistron, meaning hook, in reference to the interopercular odontodes that are hooked. This specific epithet refers to its pear-shaped body(-formis=body). Size 83mm or 3.3" SL. Find near, nearer or same sized spp. Distribution South America: Acaray River basin in middle Paraná River drainage.